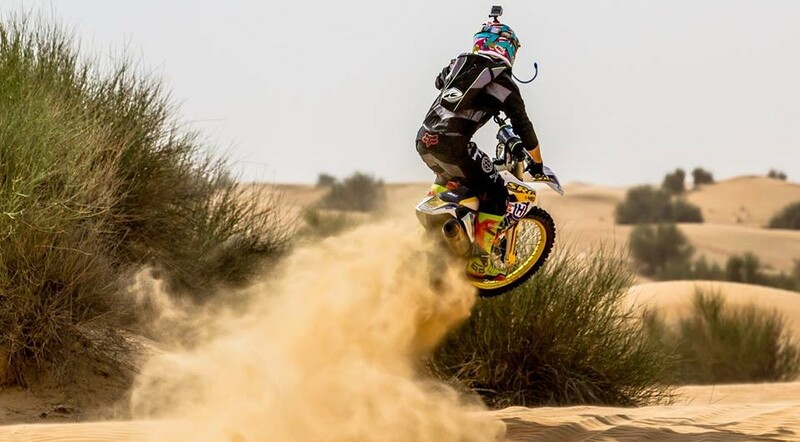 SRG Enduro Tours also offer Emirates Desert Championship packages throughout the winter months. Racing consists of a 20-25 km desert loop over a 2 hour time period which runs as a 5 round championship from October till March. All levels of riders are welcome to enjoy a hassle free racing experience which includes 1 days training and pit support from our race team. One of our top priorities here at SRG Enduro Tours is keeping our customers safe. To combat gravity we provide top safety equipment and expertise to prevent injury. From the bottom up we have ACERBIS boots. EVS covering your knees, body, elbows and kidneys. Latest HUSQVARNA GOTLAND riding pants and shirt. 100% goggles. OGIO camel packs. FOX RACING helmets which are custom painted to make sure we look cool whilst dune bashing! Photo shoot with Ray Archer. Welcome to SRG Enduro tours! We offer a range of 5* enduro tours around the UAE on our latest Husqvarna motorcycles.